Just over a year ago, I unpacked my waterproof bag, which was filled with all the gear essential for the spectrum of summer conditions in the Arctic National Wildlife Refuge. Quite frankly, I am still unpacking that experience and sharing with others what it meant to spend nearly a week in one of the wildest and most remote places in the world—especially in the context of the work I do leading and inspiring Outdoor Afros around the country to engage with nature. A stellar and experienced Sierra Club team led and supported us, but before we left, our friends and families still admonished us to “be careful.” They did not know that the coming experience would be a gift, helping us understand what it means to be human in relation to the wild. The first afternoon in the Mollie Beattie Wilderness, we had a bear in camp. Yes, a grizzly. And yes, it was frightening. No physical barriers stood between our group and this creature. For what seemed like several minutes, it curiously observed us. Then, following a sudden whiff of northern air and a distant Porcupine caribou herd, it disappeared without fanfare into the Brooks Range. I realize now that the experience was not about the bear, or our fear of it, but rather our awareness of our humanity in its presence—in its wild. We were not at the top of the food chain. We continued to see many creatures—countless caribou, several birds on my life list, tenacious mosquitoes—all in an ever-changing climate that did not care about our presence or comfort. This kind of wild will continue to roll on and thrive without regard for its human passengers. The wilderness as I experienced it in the Arctic is a system of immeasurable strength and resiliency. It was an honor to step out of my illusion of control and to know a type of dependence and fragility found only in the remote wild. I know I am better for it. 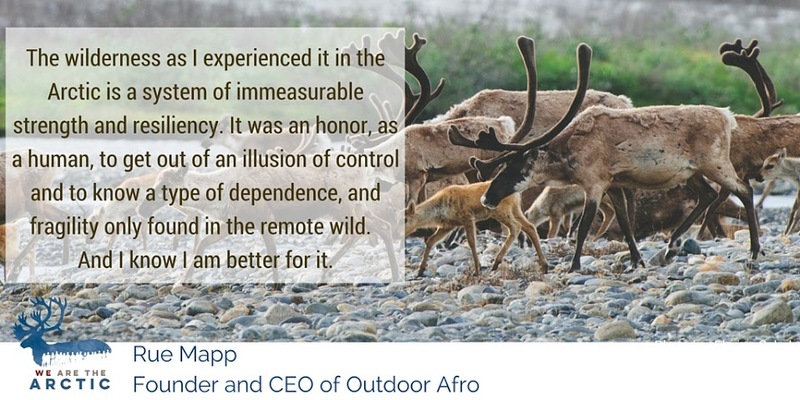 Rue Mapp founded Outdoor Afro as a blog in 2009; since then it has grown into a national organization that connects people, especially from the African-American community, to nature and the benefits of spending more time outdoors. Hear Rue explain in a video why she's joining conservation and religious leaders, Alaska Natives, communities of color, outdoor enthusiasts, veterans and communities of faith from across the U.S. to protect the Refuge.